The powerful smoothie ingredients could stimulate your life and make you healthy. Smoothies are undoubtedly a quick, portable, and mouth-watering way to gain a variety of nutrients for your body. The next time you make your own smoothie. If you are searching things to put in smoothies, I have got you covered. With the trend of smoothies, we list 12 smoothie ingredients in the following infographic. Try adding one of these items to shake up the flavor and nutrition a little, that would offer your body the fuel it needs to build muscle, burn fat, and boost energy. 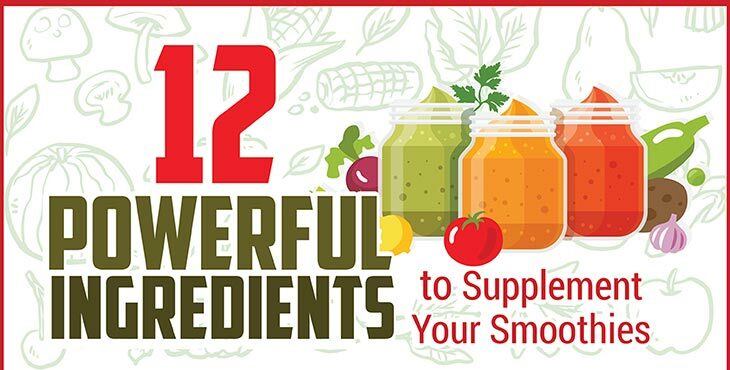 12 powerful ingredients to supplement your #smoothies! If you find this infograhic helpful, feel free to share it to your friends and don't be hesitate to leave comment below to share with us your experience.